From Tales from the Loop to Kids of Bikes, the genre du jour for roleplaying games is that of kids in peril, investigating mysteries that adults cannot see or do not want to investigate, and facing unknown horrors. Specifically set in the early 1980s and in general, inspired by the Netflix series, Stranger Things. 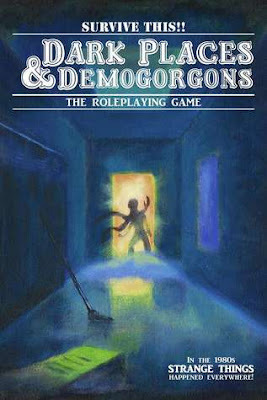 Published by Bloat Games following a successful Kickstarter campaign, Dark Places & Demogorgons: The Roleplaying Game is a Old School Rennaisence roleplaying game, which as its title suggests and as its tag line—‘In the 1980s STRANGE THINGS happened everywhere!’—suggests is heavily influenced by Stranger Things. It is a roleplaying game in which you roleplay teenagers in a small town where strange things are happening. The adults are concerned, but unsure as to what to do; the local sheriff is out of his depth and wants everyone to remain calm; and Reverend Phillips calls for the real culprits to be banned—drugs and delinquency, punk and heavy metal, and of course, roleplaying games like Dark Places & Demogorgons! Dark Places & Demogorgons is a Class and Level roleplaying game. It provides just five Levels and five Classes, although within each Class there are three subclasses, all of them highschool archetypes. The five Classes and their subclasses are The Brain (Kid Scientist, The Nerd, and The Geek), The Athlete (The Jock, Extreme Athlete, and The Karate Kid), The Outsider (Break Dancer, Goth, and Metal Head), The Popular Kid (Preppy, The Princess, and Teen Heartthrob), and The Rebel (Bully, The Hood, and Punk Rocker). Actually, this is erroneous, since there are in fact, fifteen Classes divided equally between five categories. This is simply because all of the aspects that a Class are provided by the subclass whereas the so-called Classes—The Brain, The Athlete, The Outsider, The Popular Kid, and The Rebel—contribute nothing towards character design or creation, let alone game play. Each Class provides some beginning skills, some attribute modifiers, a single ability, and some possessions and money. For example, The Kid Scientist provides Computer, Mathematics, and Mechanics & Science as skills; deducts one from the character’s Strength and Constitution, but adds one to Intelligence; and gets a +2 bonus with one of his beginning skills. He starts the game with a home computer, home chemistry set, a library card, access to the school computer lab and chemistry lab (the teacher trusts him), a bicycle, 4D6 dollars, a sack of illegal fireworks, a flashlight, and Devo’s new album. Higher Levels will add various skill bonuses and attribute bonuses. To create a character, a player rolls three six-sided dice seven times and —Strength, Intelligence, Wisdom, Dexterity, Constitution, Charisma, and Survival—and assigns them to seven attributes in any order. A character has five Saving Throws—Courage, Critical, Death, Mental, and Poison—which are each rolled on four four-sided dice and modified by a character’s Constitution bonus, even the ones which are not physical, such as Courage and Mental. The question is, why are all of the Saving Throws based on the one attribute? Just two six-sided dice are rolled for Hit Points and once a player has selected a Class and subclass, he also gets to pick four more skills other than the beginning skills listed for his Class and subclass. No more than a single point can be assigned to any skill rank, which itself cannot be higher than a character’s Level. Any bonus from the associated attribute is of course applied to this. Fighting skills—Brawling, Martial Arts, and Wrestling—are also available. They provide set bonuses and only need to be purchased once as they do not advance in Rank. Lastly, a player has the option to roll on the background table twice to add some interest to his character. There are a hundred entries, which might give a character an interest in Marvel comics, make him an exchange student, have a missing sibling, and so on. Some provide extra bonuses, others do not. Overall, the creation process is quick with relatively few decisions to be made. For the most part, Dark Places & Demogorgons: The Roleplaying Game plays as a standard retroclone, but there are some changes to the rules. The first is the addition of Survival, which although rolled the same as the standard six attributes, is not an attribute. Rather, it is a pool of points which a player can use to re-roll any dice roll. This costs one Survival per re-roll and any failed dice roll can only be re-rolled once and the effects have to be applied. Although there is no limit on the number of Survival Points which can be spent during a gaming session, they can only be recovered at a rate of one per session. This sets up a tight economy of what are essentially ‘luck points’, which does not favour the players and their characters. This is partly exacerbated by the Difficulty Checks set for using skills—ten for Easy, fifteen for Medium, twenty for Difficult, and twenty-five for Near Impossible. Few player characters are going to have more than a +2 or +3 in their skills, so any skill beyond Easy is going to be a challenge. That said, the player characters are high school teenagers and they are not meant to be necessarily competent. Where skill rolls are rolled equal to or over the Difficulty Check, those for Saving Throws are rolled equal to or under. The mechanics for horror and fear in Dark Places & Demogorgons are split between two different mechanics. In the face of a non-supernatural opponent or dangerous situation, a Courage Saving Throw and if failed, a character receives a +1 penalty on all rolls against similar situations in the future. In the face of a supernatural opponent or dangerous situation, a player must roll a Terror Check, this being made to roll equal to or over the monster or situation’s Terror value, typically eleven or more, depending on the monster. Essentially, this Terror value works as a Difficulty Check. If either the Courage Saving Throw or the Terror Check is failed, the player also needs to roll on the Failed Courage/Terror Effect table. If either roll is successful, a character does not have to roll for either again—he has conquered his fears. There is no explanation as to why the two different mechanics are used, why there are no bonuses to either roll, and so on. It certainly would not have been all that difficult to get the two mechanics to work the same way rather than confuse the issue. Of course, combat is not an unexpected feature of Dark Places & Demogorgons’ horror genre, but the fact that the rules do not reduce the emphasis on combat as they suggest they should is disappointing. Unfortunately, this is exacerbated by the underwhelming advice on running the game and not running it as a combat game. For game that is supposed to be one of horror and investigation, a single page devoted to the subject and then in hardly any depth seems inadequate, especially when combat gets four pages of treatment. The other mechanics are drawn from Dungeons & Dragons, Fifth Edition and The Black Hack respectively. One is the use of Advantage and Disadvantage dice, the other is the use of the Usage dice for equipment. That said, there is a lot of support for the Game Master. For the players there is a list of sample characters and a quick list comparing aspects of today’s culture with that of the 1980s, but for the Game Master, a good half of Dark Places & Demogorgons is dedicated to setting elements—monsters, villains, scenario seeds, and background on Jeffersontown, Kentucky. So the monsters cover cult leaders, soviet spies, and ninja as much as they do banshees, bigfoot, ghouls, golems, rodents of unusual size, and vampires. There are also table for creating your own villains and monsters. The scenario seeds also built around monsters, from Alien Life Form and Chupacabra in Love to Taylor’s Lake Monster and Teenage Werewolf in J’town. Their inspiration is obvious, but then much of the genre that the roleplaying game draws is equally as obvious. Jeffersontown, Kentucky or ‘J’town’, and its major gangs and factions, are described in just a few pages. This is where Annie Crow disappeared, Stanley Parker jumped off Popelick Train Trestle, and more, perhaps due to the feared Popelick Monster, Satan, or… Unfortunately, more attention is paid to listing what is in each of the town’s four districts than to giving a good overview or a map, so getting an overall feel for Jeffersontown is somewhat challenging—especially if the Game Master has to then impart that information to her players and their characters. What Dark Places & Demogorgons also provides is the optional Psion Class with its subclasses, Experiment X, the Pyro, and the Telekinetic. The second and third of these represent characters a la Firestarter and Carrie, so have normal backgrounds and skills, whereas the first is something akin to the character of Eleven from Stranger Things and so does not. The rules for Psionics require a roll on the Psionic Activation Table to determine if a Psion can use his abilities. His player then gets to make a roll to use the Psionic power. * Whatever that is. Again, Dark Places & Demogorgons has little to say on the matter. Physically, Dark Places & Demogorgons is decently presented and is nicely presented with a good range of art. The designers also include some high school photos from the period to add a little verisimilitude. Dark Places & Demogorgons is a game in which if you know your movies and you know its genre influences, then you can run it. If not, then Dark Places & Demogorgons may be a bit of challenge, since it is aimed squarely at the nostalgia market, for there is real no background detail given to the eighties other than listing a few differences. Similarly, the Game Master will be on her own in writing adventures as there is no advice of any substance to aid her in the process. Mechanically, it feels uninspiring and uneven, using too many different mechanics for too many different things for no real difference. Also the game is disingenuous in its use of its title, Dark Places & Demogorgons, not only because it does not include Demogorgon stats, but really it is not about running a game in the style of Stranger Things. It is more of an ‘80s teen horror’ roleplaying game, focusing solely upon the teenage protagonists and the monsters, and ignoring the world around them, which is not the point of its obvious inspiration. If you are looking for game with which to run a Stranger Things style game and have some experience running your own adventures, then Dark Places & Demogorgons might be for you. After all, it provides you with all of the parts, if not the toolkit. If you are looking for a greater examination of the genre and helpful advice in running that style of game, then Dark Places & Demogorgons fails on all counts. There is good material in Dark Places & Demogorgons: The Roleplaying Game, but it completely fails to support it in terms of advice or genre, which comes down to just run ‘Monster of the Week’ and that is not good enough. Especially when it flags its inspiration so obviously.